Click on the Apple menu on the top-left corner of the screen and select System Preferences. 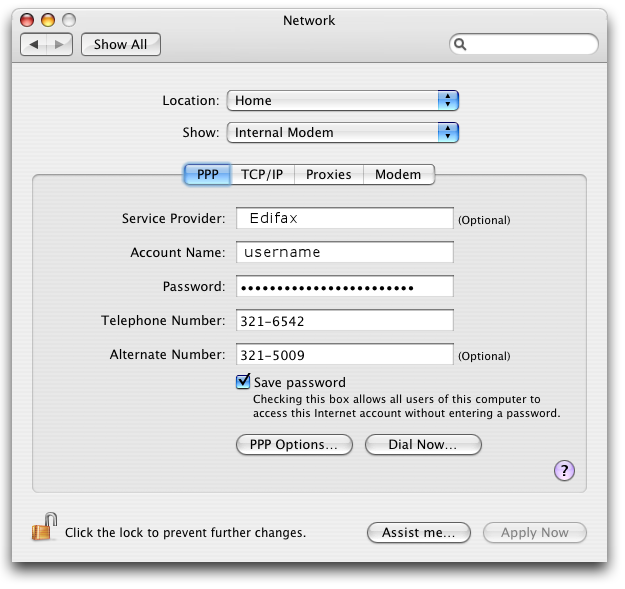 Click on the Network icon located on the Internet and Network section. After the Network Preferences window opens, click the pop-up menu next to Show: and select Network Ports Configurations. Then make sure that Internal Modem is checked. Click the pop-up menu next to Show: and select Internal Modem. In the Password: box, you have an option to either type in your Edifax password or leave it blank. If you type in your Edifax password then it will be saved on the computer and you won't have to type it in again. 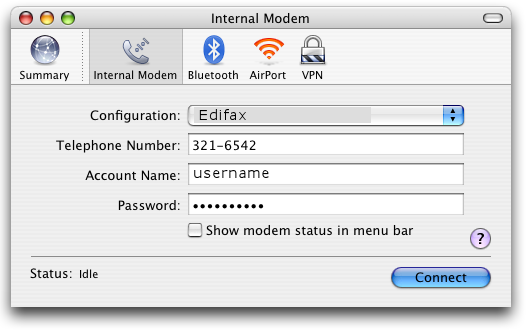 If you leave it blank then you will have to type in your Edifax password on each dialup session. In the Telephone Number: box, type in your local Edifax phone number. Click on the Go menu at the top and select Applications. Click on Internal Modem from the tool bar at the top of the window. Your computer will attempt to make an Internet connection. The Connect button will change to Disconnect when a connection has been successfully created. If you want to disconnect from the Internet, just click on the Disconnect button.